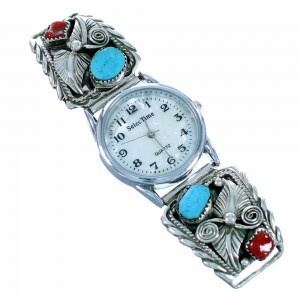 Our watch category features Native American and southwestern sterling silver watches from some of the most talented silversmiths and artists in the industry. 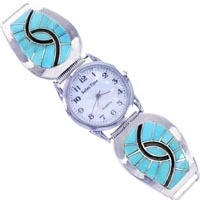 Many of the beautiful sterling silver watches and turquoise watches are inlaid with various gemstones to highlight the bold nature of our products and customers. 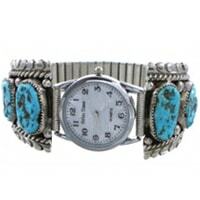 Browse through our collection of turquoise watches and sterling silver watches and you'll see that every watch is meant to make a statement. 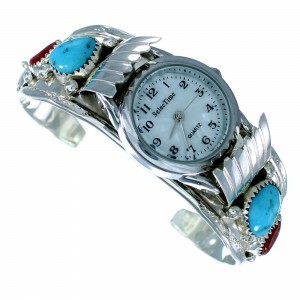 These Native American watches are a timeless piece of fashion combining classic style and modern watch technology. 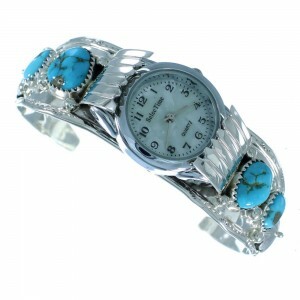 The solid mechanics included in our turquoise watches ensures you'll be able to pass down your Native American watch to your children. 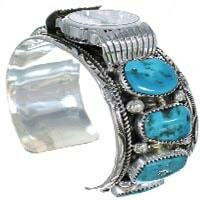 It is believed American Indians first started working with silver in the 19th century. 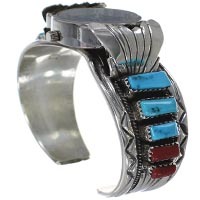 They quickly developed their own style for trade and to this day, the high desert tribes make the most beautiful examples of sterling silver watches and other products. 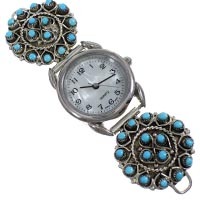 Eventually, as technology improved, artists started using their mastery of silver to create amazing sterling silver watches and turquoise watches. 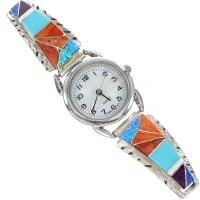 Our collections reflect the versatility and ingenuity of the southwest tribes. 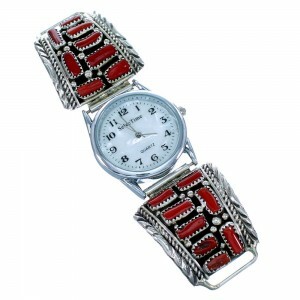 We have a large selection of Native American Indian watches, handmade by different craftsmen and silversmiths, including the Navajo, Zuni, and Hopi tribes. 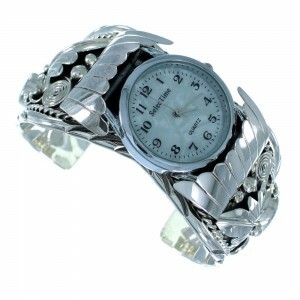 Our watches lead the industry in both style and value. 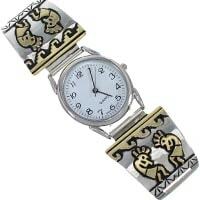 The intricate designs and artistic stonework make these some of our most popular items. 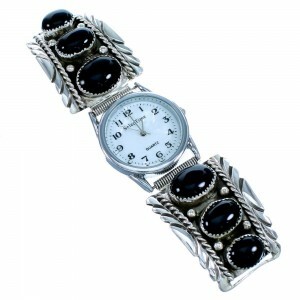 Our sterling silver watches feature the design and technique that make these products so popular. 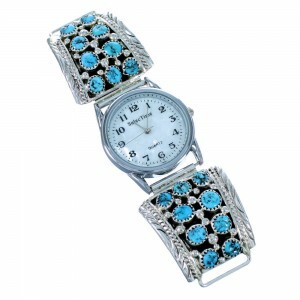 Such stunning watches are offered here at the best prices available, and this includes our growing inventory of turquoise watches. 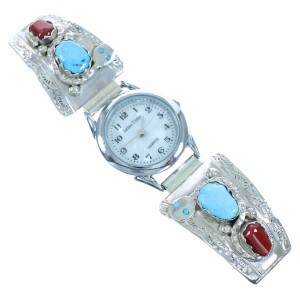 Watch styles will range from a simple sterling silver watch, multiple stone turquoise watches, and plenty of other styles. 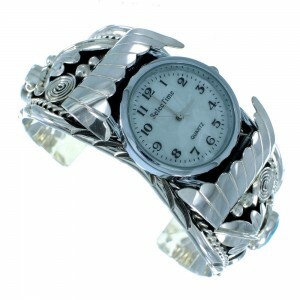 We have a selection to suit every style and every occasion. 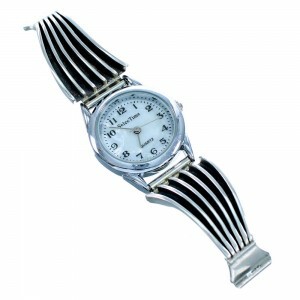 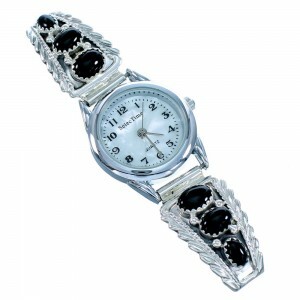 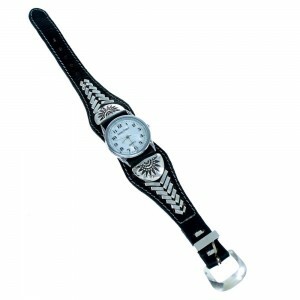 A sterling silver watch is one of our most sought after items for those looking for a bit of casual elegance. 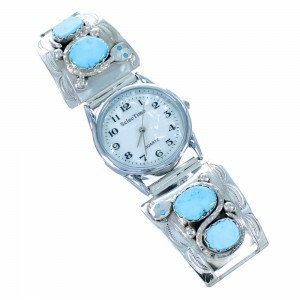 For formal occasions, consider one of our turquoise watches for an upscale statement inspired by the best artists in the industry. 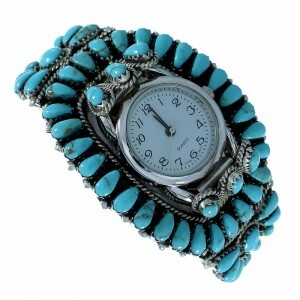 Our turquoise watches for women will add some high desert fashion flair to evening gowns and sun dresses alike. 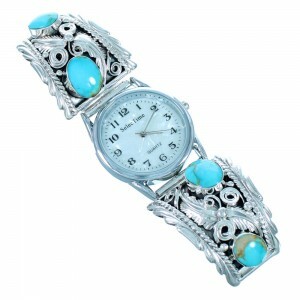 Every turquoise watch band is crafted to highlight the beauty and creativity of every item in our catalog. 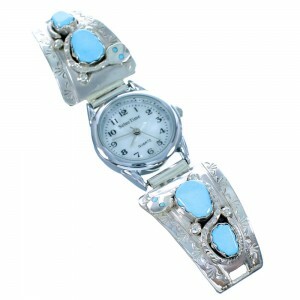 Our watches also come in a wide variety colors, including turquoise watches made with mastery of the silversmith technique. 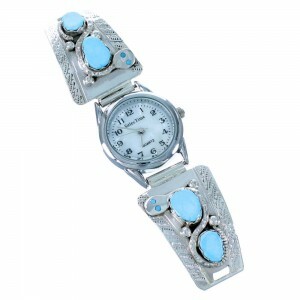 In turquoise watch stones we have a huge variety that range from deep blue to green turquoise coming from different mines, including the Sleeping Beauty, Kingman, Number 8 turquoise, and more. 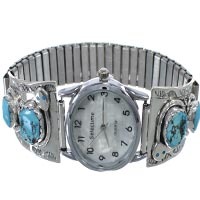 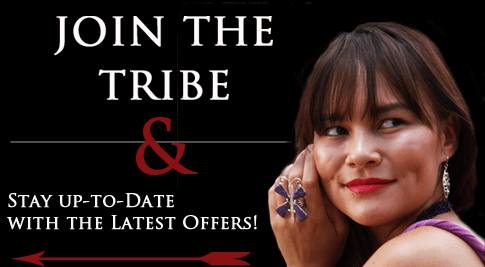 We have one of the biggest selections of Native American watches online, and at SilverTribe we always try to provide you with the best prices on all of our jewelry. 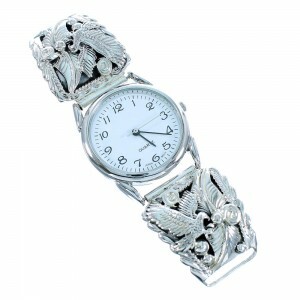 Spend some time looking through our collection of sterling silver watches to find the right addition for your collection. 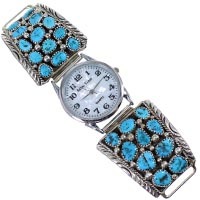 Whether you are in the market for a one-of-a-kind turquoise watch or a beautiful sterling silver watch, SilverTribe will make sure you get the perfect watch at a low price. 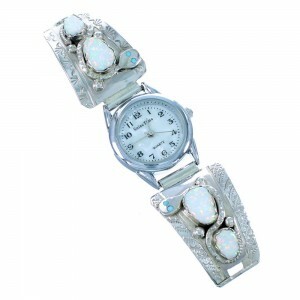 We have led the industry for years thanks to the unwavering quality of our turquoise watches.